﻿A common heart drug may stop the progression of angiosarcoma, a cancer of the inner lining of blood vessels, according to a study by researchers at Texas Tech University Health Sciences Center (TTUHSC) El Paso. Angiosarcomas are highly lethal tumors that can occur in any part of the body. The tumor typically appears as a growth or lesion on the skin; the larger the growth, the greater the risk of mortality. 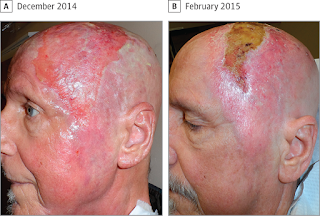 In 2014, Brad Bryan and William Chow treated a man with an enlarging lesion on his left cheek, forehead and scalp. Biopsy revealed it was angiosarcoma, and the case didn't look good. "We were presented with a patient exhibiting a rapidly expanding uniformly fatal tumor with no realistic options for a favorable outcome based on current standard treatments," the two researchers wrote in their study. Previous research suggested that propranolol - a drug that's typically used for high blood pressure - might be effective against angiosarcomas, so the researchers proceeded to use the medication to treat the patient. After one week of the propranolol treatment, the tumor ceased its rapid expansion and showed no evidence of clinical enlargement or extension. Within six months of use of propranolol - and eventually, added chemotherapy and radiation - the patient's tumor was undetectable. The results are published in the journal JAMA Dermatology. The finding is not only promising against cancer, but for patient finances. Current prescription drug therapies for sarcomas can cost patients more than $10,000 a month. Propranolol, however, costs about $4 a month. "If this finding extends to a broader patient population, administration of propranolol may be a major advancement in the treatment of angiosarcomas," Bryan and Chow write. Along with other TTUHSC El Paso researchers, Bryan is currently conducting a Phase II clinical trial to test the effectiveness of propranolol in decreasing tumor growth in breast cancer patients. If the results are positive, the trial may expand to include more common tumors. Based on material originally posted by Texas Tech University Health Sciences Center El Paso.